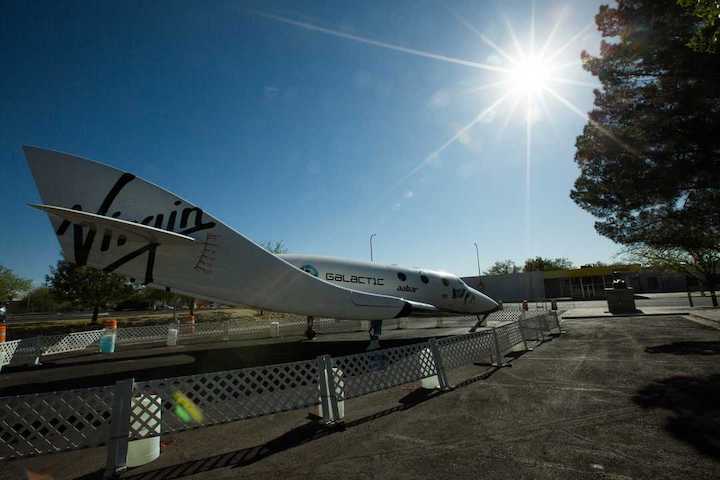 A full-sized model of the SpaceShipTwo is displayed in the Spaceport America terminal-hangar on Wednesday, April 20, 2016, as WhiteKnightTwo test flights are conducted by Virgin Galactic's Operations team outside of the hanger. LAS CRUCES - Will Virgin Galactic launch the first commercial astronauts into space within the next three weeks? 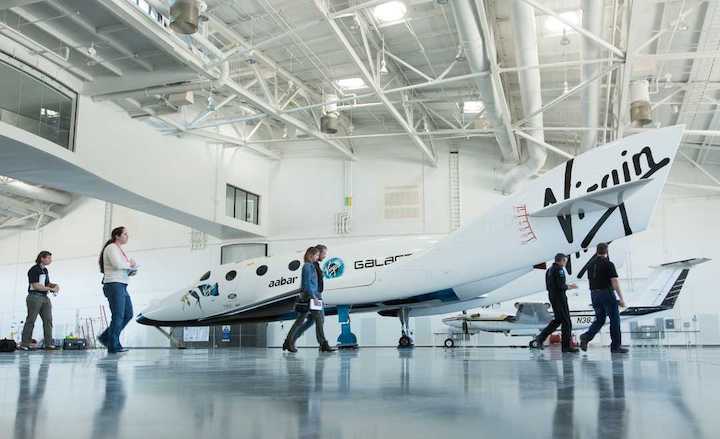 Richard Branson, the billionaire founder of the commercial space flight company, told CNN last week, "I am pretty confident that before Christmas, Virgin Galactic will be the first to have people, in the form of astronauts, in space." That would mean that by Dec. 25, Virgin Galactic's craft, SpaceShipTwo, would carry human pilots 50 miles over the earth. In 2014, a test flight of the company's spaceship ended in a crash that killed pilot Michael Alsbury in California. This year, the company seemed to rebound, resuming test flights at altitudes up to 32.3 miles, boosting confidence that the company may soon proceed with commercial flights out of New Mexico's Spaceport America. The facility is adjacent to the White Sands Missile Range in the Jornada del Muerto desert basin, 45 miles north of Las Cruces. Branson has predicted and missed deadlines for achieving commercial space flight in the past, but his latest claim generated widespread media coverage and speculation as to whether Virgin would beat its leading competitors in the race for commercial space flight: Elon Musk's SpaceX and Jeff Bezos' Blue Origin. Virgin Galactic spokeswoman Aleanna Crane told the Sun-News that, Branson's optimism notwithstanding, "Our timelines are driven by safety." Branson affirmed that himself in the same CNN interview, telling CNN, "Safety's all that matters if you're putting people into space, so none of us will race to be the first." He then predicted, nonetheless, that his venture would be first. Crane said the final portion of the company's flight test program was making "good progress." "We have completed three successful powered test flights this year," she said. "This next phase of test flights will see the spaceship burn its rocket for longer durations, resulting in faster and higher flights." Jason Lazich, Virgin Galactic's director of infrastructure and ground services, confirmed that even if the company does get a crew into space by Christmas, they will not be launching from New Mexico's spaceport but rather from the company's testing facility in the Mojave Desert of California. “Once the test program is complete in Mojave, that’s where we’re looking to transition into commercial operations at Spaceport America,” Lazich said. 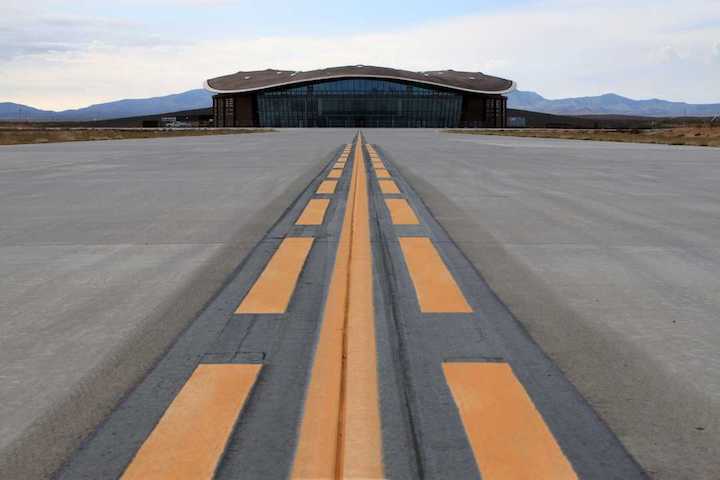 At that point, activity at the spaceport may pick up considerably as its anchor tenant moves closer to its promise to provide commercial space flight. Several hundred prospective passengers have committed up to $250,000 apiece in advance. Whenever those flights begin, there is no suspense over who will be the first tourist in space. Branson made it very clear in his CNN interview he is holding that reservation himself.